Each service is represented by its own university organisation. Recruitment takes place once a year in early October – visit the stands at Freshers Fairs at any of the universities in the region. Membership is open to undergraduates who meet certain admission criteria and will usually last at least two academic years or however long your degree course takes to complete. Pay is at the standard service rate, with a tax-free bounty paid on the completion of each full year’s training. Each service offers broad military experience, adventurous training opportunities and a fantastic social life. Whilst administratively linked with Birmingham University, each Unit covers all the Universities within the Region. The Birmingham University Royal Naval Unit (BURNU) is based at HMS Forward in Birmingham. Training is based upon Officer Training for the Royal Navy. There are 14 University Royal Naval Units (URNU) located around the country offering opportunities to 700 undergraduates from the country’s leading universities in England, Scotland and Wales. Each unit has a P2000 Fast Inshore Patrol Crafts that together form the First Patrol Boat Squadron. Their primary role is to support the URNU but they also contribute to a wide range of Fleet tasking. The aim of the URNU is to broaden Naval understanding and develop undergraduates who show potential to become the leaders of tomorrow, through maritime experience and exposure to the values and ethos of the Royal Navy. Each URNU is commanded by a Royal Navy (RN) Lieutenant who is responsible for 51 undergraduates during their time in the Unit. It is not a recruiting organisation and membership of the URNU carries no obligation to join the Royal Navy on graduation. URNU members are taken to sea at weekends and during their vacation periods. In addition they have opportunities to take part in sporting events, adventurous training activities and gain a CMI qualification all within a vibrant and friendly social scene. HMS Exploit is the Birmingham University Royal Naval Unit's Training Patrol vessel, although the unit covers a wide area, taking undergraduates from eight Universities in the region including Loughborough and Warwick. The Unit meets every Thursday evening at HMS Forward, Birmingham's Royal Naval Reserve Training Centre. University Officer Training Corps Birmingham (UOTC Birmingham) is based at Montgomery House in Sparkbrook (Birmingham). Training is based upon Officer Training for the Army. UOTC Birmingham is a military organisation that develops the leadership ability, self-awareness and self-confidence of selected students throughout their time at University. Established in 1900, Birmingham UOTC has provided a challenging and exciting environment for students for over a century. Open to students across the entire West Midlands, BUOTC provides an opportunity to develop numerous skills such as leadership, teamwork, communication and organisation within a military environment. 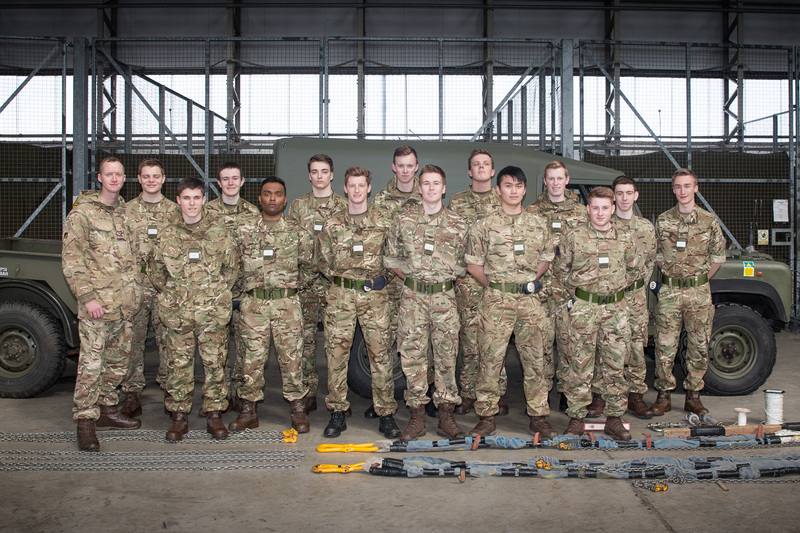 The UOTC training programme is moulded around the university timetable, and is designed to cater to students. Weekly training is conducted on a Wednesday evening, from 1700-2100, which includes dinner and social time in the Mess afterwards. Training continues on weekends, with a total of 7 being held each year held at camps across the West Midlands and Wales. On top of this, a 2 week annual camp is held at the start of the summer break. Additional courses can be made available to those who wish to progress towards a reserve commission whilst at the UOTC. The University of Birmingham Air Squadron (UBAS) is based at RAF Cosford. Training is based upon Officer Training for the Royal Air Force. One of 15 University Air Squadrons (UAS), UBAS aims to provide flying training, adventure training, basic military skills and personal development to its students. Joining a UAS will provide the perfect introduction if you're considering an RAF career, whether in a flying or ground-based role in the Regular or Reserve forces. There is no obligation to sign up and by getting involved you're making no further commitment other than your time and effort. The training and personal development you receive will give you a head start in whatever career path you choose. Whilst membership of a UBAS does not commit you to joining the RAF, you do have to agree to commit some of your time. As a minimum, members are required to attend 15 training nights during term time (approximately one every fortnight), a one week training camp during both the Easter holiday, a two week training camp during the summer holiday, a one week Induction Camp in December for all first years and in addition, both sponsored students and first years are expected to complete a week's Summer Vacation Attachment, spent on an active RAF base shadowing an officer and getting a taste of active RAF life.